Today we learned about the long history of Randall’s/Ward’s Island. Orginally they were two separate islands but now they are connected with Little Hell Gate representing where they used to be separated. Today started with a tag-team lesson from Cappy and Kara. After learning all about circumnavigating and what is now Randell’s/Ward’s Island, it was time to gear up for the ride. We ran into our first obstacle on our way to cross the Ward’s Island Bridge: it was up for construction! However, Cappy, our fearless leader, directed us over to the Tri-Borough Bridge. CRISIS AVERTED. 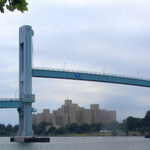 From there we traversed over to the northern end of Randell’s Island, and threw stones into the Bronx. I repeat: we threw stones from Manhattan to the Bronx. No, we don’t all have Arnold Schwarzenegger-like strength, we just had to throw them a mere few hundred feet over the Bronx Kill. A hungry Cappy then started snacking on some plants, but as he explained, mugwart is a perfectly edible plant. Sabian and Jasmine both followed suit but after their faces twisted up from the bitterness, no one else dared try it. Next, we checked out Icahn Stadium where Usain Bolt broke then 100 meter record in March 2008. Pretty cool! From there, we passed by Little Hell Gate, which represents the old division between Randall’s and Ward’s Island and we made our way into the Ward’s Island section. Our last stop of the ride was to check out a interesting art installation on the South East side of the island. It was a pretty cool wood and glass structure that overlooked the Ward’s Island Bridge. Now, having conquered most of the island, it was time to head home. Luckily, this time we caught the Ward’s Island Bridge just in time before they put it back up for construction. We made our way back to the Isaac’s Center where we edited our pictures and posted some comments, over lots of giggles and some Justin Beiber songs. The word of the day was circumnavigate which means to sail around but in this case we ride on a bicyle. Really Calvin ” LOL ” ” Swaggie” whats next? i fell so many times EPIC FAIL kept my swag 2 Chainz! Calvin probably has gained -235 points…rough estimate. I just gave Jasmin and Destinee Cyclopedia nick names. So Calvin you are now known as ” Cyclo Swagger”. Sabian you need a nickname too. So by the powers vested in me you are officially ” Young Magna Carta”. Felix will earn a nickname when he comes back to the program and earns it.